and gold, lots and lots of gold. 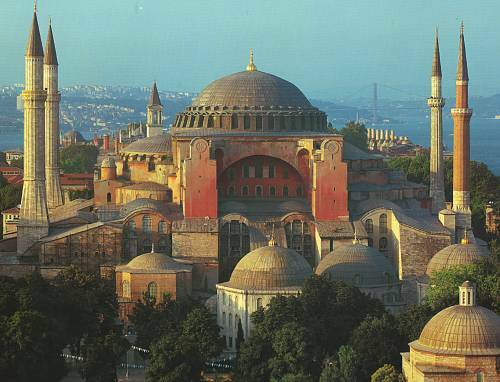 I also think of the great domed Hagia Sophia in Constantinople (now Istanbul) –– it’s the alpha and omega (τὸ Α καὶ τὸ Ω) of Byzantine culture –– and full of, yes, you guessed it –– gold and mosaics and sad faced saints. 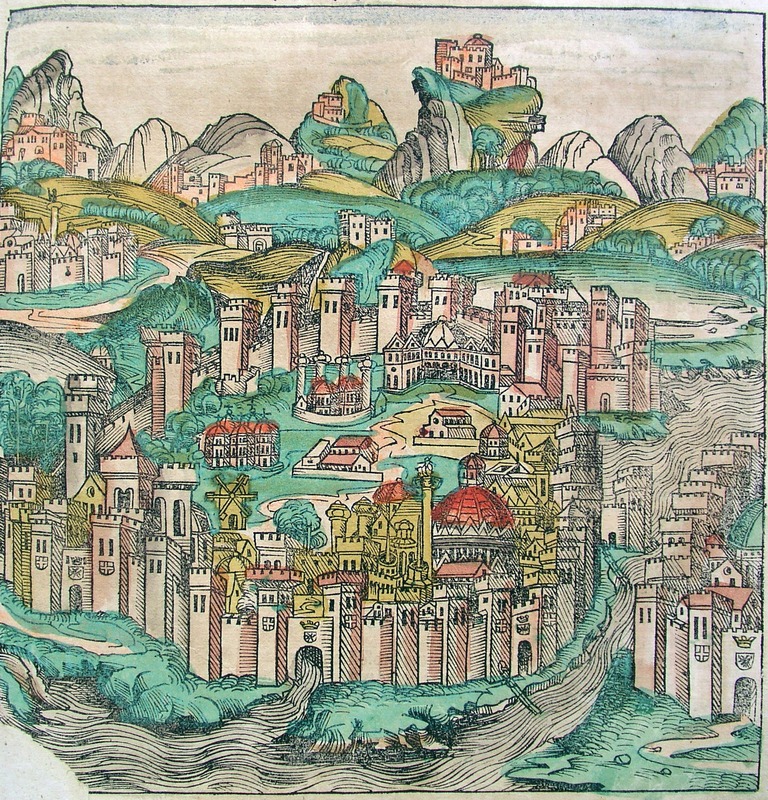 The Byzantine Empire covered a remarkable 1000 years from the 4th century to 1453. It was a continuation of the Roman Empire since Byzantium was conquered by Roman Emperor, Constantine the Great (the first emperor who converted to Christianity) in 334 and was built on 7 hills like Rome (although Constantine first called it New Rome). The seat of power was centered in Constantinople (formerly called Byzantium) rather than Rome, and it was a Christian rather than a pagan empire. It was most powerful before the 1st millennium but its stretch was considerable in the arts, architecture and politics (and is still stretching in a popular video game set in 16th c. Constantinople, Assassin's Creed!). It was known as the Empire of the Greeks. 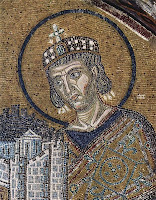 My favorite Byzantine character was The Emperor Justinian, son of a Illerian peasant (in what was formerly Yugoslavia). He was the man behind the building of the Hagia Sophia (meaning Holy Wisdom in Greek) –– one of the most magnificent structures of the Middle Ages (and the largest cathedral in the world until the 16th century) that he had designed by a physicist and a mathematician –– a stroke of genius that may account for its extraordinary curves and angles and the play of light from the windows. The fortress-like exterior doesn’t prepare you for the surprise of the wonders within. 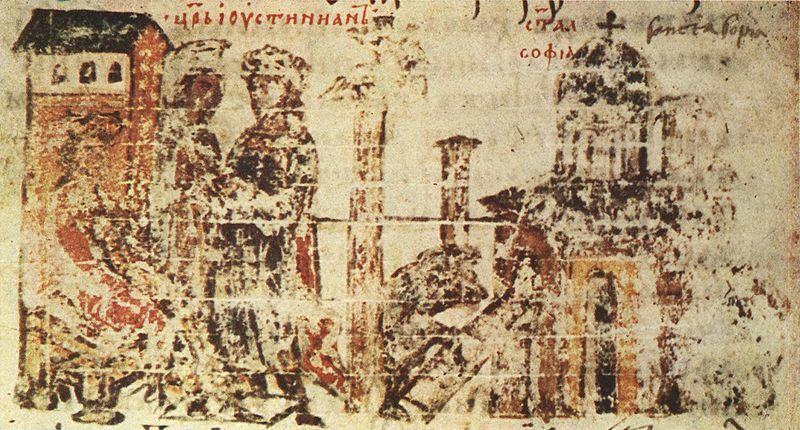 Justinian also re-wrote Roman law (Codex Iustinianus or Corpus Juris Civilis) and had the plague that wiped out a quarter of Europe named after him (The Plague of Justinian). 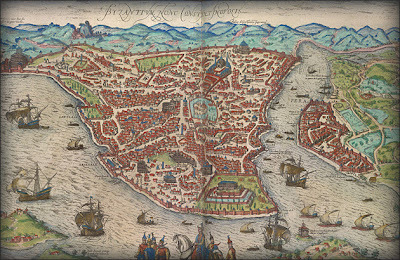 The plague also took out 40% of the population of Constantinople leaving his seat of power battered (it was thought the plague came over with Egyptian grain that was needed to feed the enormous city). 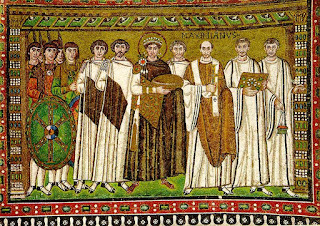 Justinian was an original leader for his times. Since he wasn’t an insider, he assembled a court of worthy men of talent and vision. 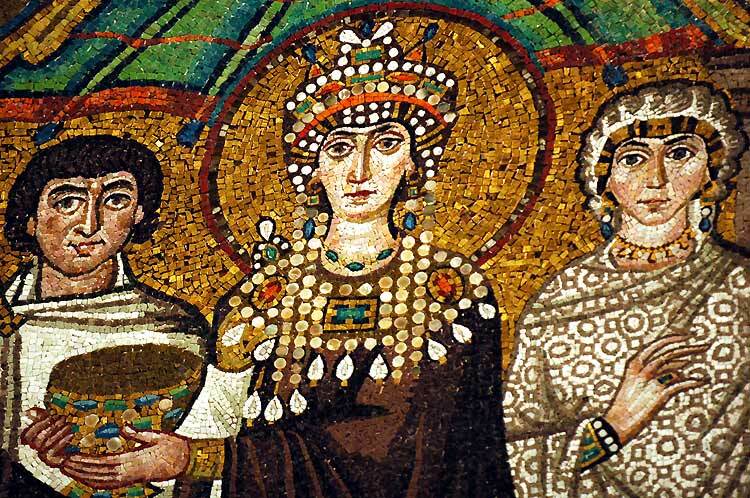 Some say he rewarded men for their gifts, not their pedigree (his wife Theodora was a former courtesan –– brilliant in her own right, and brave… she faced down a rebellion when Justinian was going to throw in the towel, but also very very vengeful). 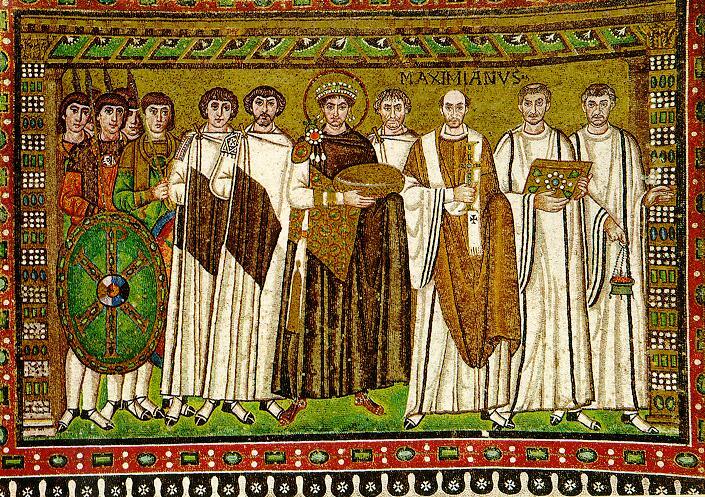 Justinian was also involved in a lot of fighting –– that was one of his many downsides (that and clawing taxes from a populous devastated by the plague to pay for his wars –– not nice). 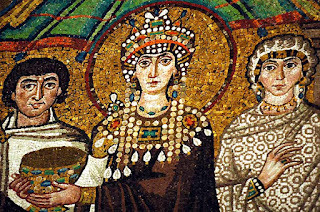 Procopius, a contemporary of Justinian, thought he was an inept rapacious mess and his wife a monster, and wrote a book about it, Secret History of the Court of Justinian . 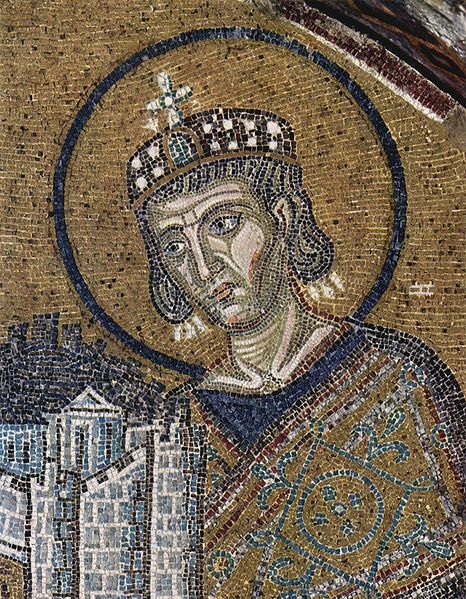 Decide for yourself, history is all about interpretation (was Procopius a disgruntled fellow who was getting back at Justinian for imagined slights or a beacon of truth?). Justinian did have that church built to replace one that had been destroyed in ferocious battle (there’s a great book on this called Byzantium by Robin Cormack full of AMAZING pictures) and for that alone he should be lauded. Byzantine cuisine was a merger of Greek and Roman traditions but because of the size of the empire, it absorbed others as well and was richer for it. The upper classes ate a healthy diet of salads and grains and eggs and were famous for ‘sphoungata’ –– a kind of spongy omelette. They ate a lot of chicken and fish, a little pork and very little lamb and beef. The first mention of caviar comes from Byzantium. It seems they did boil things … a lot. 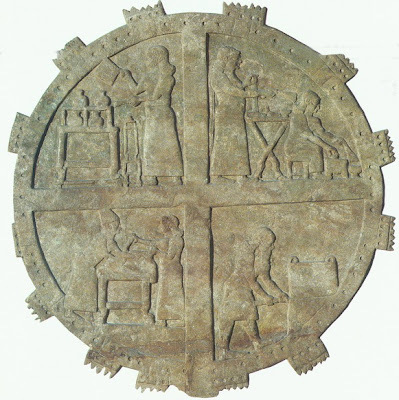 Wikipedia quoted a pejorative Byzantine expression: “the lazy cook prepares everything by boiling”, well at least the bad cooks did. Judging by food descriptions of the day, the rich had a varied and delicious diet. If the recipes of Anthimus (the Byzantine physician exiled to the court of King Theodoric and compiler of the what has become known as the 1st French Cookbook, De Observatione Ciborum) are any indicator of his native cuisine –– the court of Justinian ate well indeed. They used Garum as a major condiment (the ubiquitous Roman fish sauce). But there was another that came up, influenced by middle-eastern and Spainish cuisine… Murri. I began Lostpastremembered 2 years ago but before that I was a serious food history nerd (ok, I’ve always been a bit of a nerd). I love looking things up, following quirky paths and making discoveries about what most people would consider weird ingredients. It was and is great fun for me. A few years ago, I read an article about this sauce called murri. I can’t remember the article that brought me to it but the idea of an ancient salt sauce that was neither soy nor fish appealed to me in a big way and the ingredients were a compelling combination of grains, spices and even fruit, I found and saved the recipe. I made my first batch nearly a year and a half ago and it keeps getting better with age (I keep it in the fridge, fyi). Then I tried a more ancient version from 13th century Baghdad that involved rotting barley –– that became an interesting science experiment full of molds and fungus. I found that by heating it I had done wrong (killed all the happy bugs, said Charles Perry) but the result is still delicious a year later (it also has a wonderful complex flavor). happy mold, with grape leaves instead of fig…. With my stock getting low, I made the 2011 batch. The Byzantine murri came out a little lighter this time around since I didn’t brown the toast as much as I had before. My efforts at the rotting barley this summer (2011) failed and turned into a gluey pink rotten mess (it should smell like a forest floor, not like the reek oozing from a NYC garbage truck). The 2nd batch turned black and had a bit of bitterness to it… completely different from the 2010 version… the jury is still out on that one. I guess what I’m telling you is, Byzantine Murri is a sure thing and the safest thing to make. The rotted barley version is wonderful if it works but it could be a dangerous proposition. All of the murris are extremely salty so use them sparingly and don’t add additional salt before tasting your dish... it’s like liquid salt. What you will end up with is just splendid. It has a magical quality that adds an amazing depth to all meat dishes that I’ve added it to… what remarkable results. It’s not that it tastes great by itself, but alchemy happens when it joins other flavors. 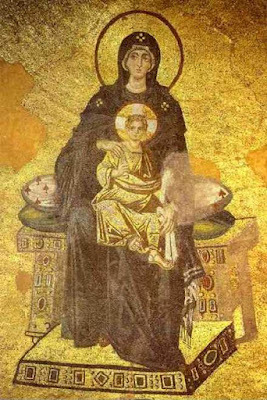 I'd like to share it (and the wonderful Byzantine art) as a Christmas present to you... it is a gift to your cooking for sure. I originally found the Byzantine Murri recipe on the site Coquinaria , but it and the other versions came from Charles Perry, former LA Times restaurant critic and expert on the ancient cuisines of the middle east and North Africa among others. 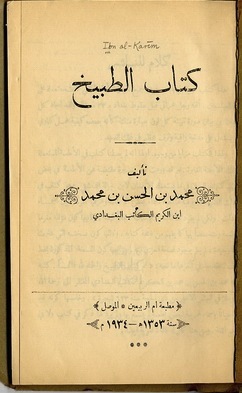 He translated Kitab al Tibakhah from the 13th century (a great book to own, titled A Baghdad Cookery Book). I have made a few wonderful things from the book. It was he who spurred me on to make the rotted barley murri after I met him at the Oxford Food Symposium last year. He patiently endured my sending him photos of the progress to check the quality of the mold (it should have what looks like spider webs, sign of the existence of aspergillus mold that’s also used in making sake) and even tasted one of my concoctions! For that I will be eternally grateful. Once you’ve made your murri, you need to take it out for a test drive, don’t you? I found this recipe for merguez (or Mirkâs) from Al Andalus Cookbook of the 13th Century , translated by Charles Perry. It is completely different from the spicy and positively red with chilis merguez we think of today because the recipe pre-dates the discovery of the new world! It started out as a warmly spiced and fragrant mix, served with a greened, vinegared sauce. I’ve always used pomegranate molasses with my merguez so my recipe includes it, the original does not. It’s really good and the murri works its magic on the lamb. May I say these are great for hors d'oeuvres served sliced and sauced on bits of pita or alone. boil then turning off the heat and repeat several times till it tastes scorched. I used my homemade wheat/rye bread and toasted it till it was nearly burnt then mashed it. The anise and fennel were toasted in a frying pan then ground in a mortar with celery seed and walnuts. The quince was quartered and cored and cubed. After it was all boiled together for about 2 hours they recommend that you put in a potato ricer, to squeeze out the liquid and then add lemon juice. The recipe makes about 1 1/4 to 1 1/2 c of liquid. Add another 1/2 c of water to the residue, simmer 1/2 hr -1 hr, and squeeze out that liquid for the second infusion, which yields about 1/3 c. A third infusion using 1/3 c yields another 1/4 c or so." It is as nutritious as meatballs (banâdiq) and quick to digest, since the pounding ripens it and makes it quick to digest, and it is good nutrition. First get some meat from the leg or shoulder of a lamb and pound it until it becomes like meatballs. Knead it in a bowl, mixing in some oil and some murri naqî', pepper, coriander seed, lavender, and cinnamon. Then add three quarters as much of fat, which should not be pounded, as it would melt while frying, but chopped up with a knife or beaten on a cutting board. Using the instrument made for stuffing, stuff it in the washed gut, tied with thread to make sausages, small or large. Then fry them with some fresh oil, and when it is done and browned, make a sauce of vinegar and oil and use it while hot. Some people make the sauce with the juice of cilantro and mint and some pounded onion. Some cook it in a pot with oil and vinegar, some make it râhibi with onion and lots of oil until it is fried and browned. It is good whichever of these methods you use. 2 ½ ’ of sausage casings (these freeze beautifully, I cut them in lengths, wind them and freeze them so I always have them on hand when I want to make sausage. Put the mixture together and fry some to taste for seasonings (I like adding a little more lavender, pepper and cinnamon myself), it’s really important to do this before you invest in stuffing the sausage. When you like what you taste, stuff the sausages and dry in the fridge for a few hours uncovered (this helps them brown better, your casings will have been soaking in water so this will dehydrate them). If you don’t want to go the stuffing route, this is just fine sautéed in patties. Fry the onions till browned and add the vinegar and pomegranate molasses and granadine or pomegranate juice. Stir to blend and then pour over the sausages, serve with chopped cilantro and mint sprinkled about or stir the herbs into the sauce and wilt them... not as bright in color or flavor if done that way. This is fabulous on a bed of whole wheat couscous. Take 5 ratls each of barley and flour. Make the flour into a good dough without leaven or salt, bake, and leave until dry. Then grind up fine with the barley, knead into a green trough with a third the quantity of salt, and put out into the sun for 40 days in the heat of the summer, kneading every day at dawn and evening, and sprinkling with water. When black, put into conserving jars, cover with an equal quantity of water, stirring morning and evening: then strain it into the first murri. Add cinnamon, saffron and some aromatic herbs. Take barley and wheaten or barley flour, make into a dry dough with hot water, using no leaven or salt, and bake into a loaf with a hole in the middle. Wrap in fig leaves, stuff into a preserving-jar, and leave in the shade until fetid. Then remove and dry. How to make al-Murri al-Naqî‘ lil-Maghâriba (the infused soy sauce of the North Africans). Knead barley, unleavened and without salt, exceedingly well and make it into loaves, each one half an Egyptian pound. Then wrap them in male fig leaves and insert fig tree 1 twigs into them as far as the leaves will permit. Spread them out on barley bran and arrange them side by side in a house which sunlight does not enter, or not much. 2 Then leave it 20 days. Turn it over, top to bottom, and leave it another 20 days. Then you gather them with their rot and leaves and pile them up and leave them 20 days. Then you break off a piece of it, and if you find red veins inside, it is quite ripe. If not, leave it another 20 days. Then you put it in a new vessel, or (one) with a trace of oil, and it should be wide-mouthed. And you put it on the rooftop so that the sun falls on it most of the day, and you put water on it until its consistency becomes like flowing date molasses. You throw into it broken-up carob, fennel stalks, citron leaves and the pith of (bitter) orange branches, of each as much as is abundant, and two or three pine cones, as much as is done; let their seeds have been removed. You stir it with a stick of fig wood with branches, putting its end to the bottom and its root on top and stirring it with the strength of violent heat. And you cover it with a sieve woven of bast and esparto and put a cloth on it to prevent wasps 5 and flies from falling in, for they often love it ardently. Leave it in the sun 40 days. Then you clarify it with a filter and put it up in a clay pot 6 for the sun, shielded with oil. Then, for every 10 Egyptian pounds, you throw in a third of a pound of flour of groats, kneaded leavened and baked in the bread oven but not completely done. Then break it into crumbs while hot into this raised 7 (sc. murri) and leave it in the sun for ten days. Strain it and put up in glass vessels sealed with oil. This is the first extraction, 8 and it is the excellent one. If you want to extract another from it, take that which you left before and add water to it and leave it another 40 days. Then, after straining it, throw in hot bread as you did before, and you leave it 10 days and strain it, and it is the second water. And if you want a third and a fourth, do so. Then keep the dregs and dry them in the shade as loaves, for they enter into some dishes. Thanks to Statewide Granite and Marble in Jersey City for the wonderful stone piece!! 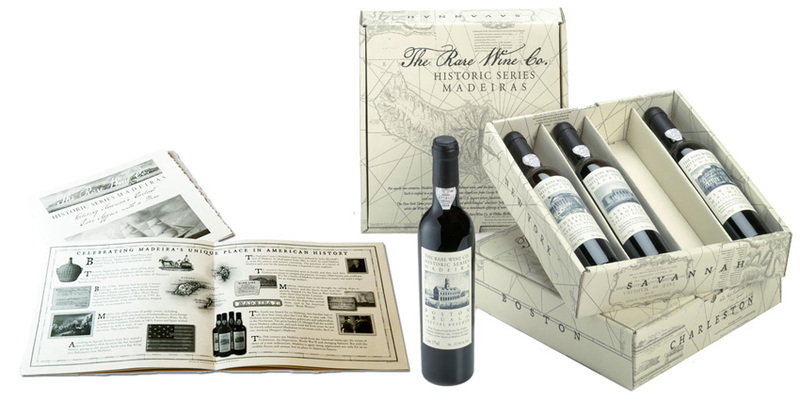 One of my favorite ingredients in the world is Madeira, and Rare Wine Co. is doing a fabulous box for the holidays filled with a selection of 4 gorgeous wines for a song... ranging from sweet to dry for all your needs... this is a perfect gift for you or your friends who love to cook! Go HERE to get it. History, alchemy, gastronomy - I think you covered it all with this one! Not sure I'm up to creating my own murri (still working on bread starters) but it looks like a fascinating process. Byzantine Art has such a magically exotic appeal and so has the Murri sauce. We love the idea that alone Murri is rather strange but something wonderful happens when combined with other flavours. 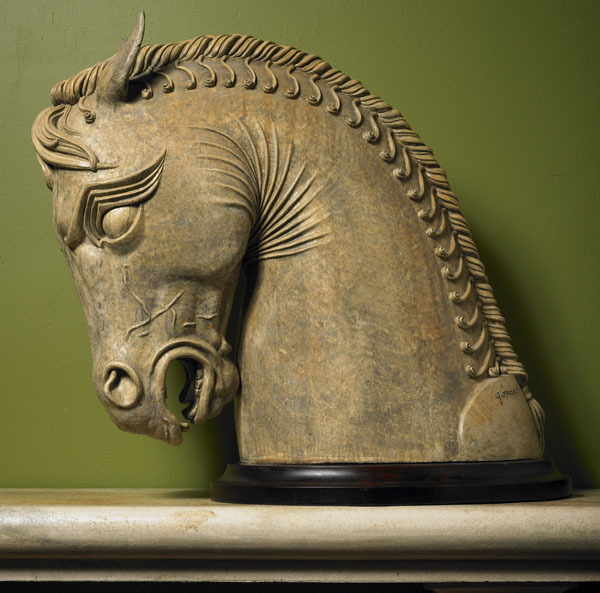 Just like the Art which, alone, can for us be rather too gold and glittery, but when placed in a building of tremendous opulence and scale, it suddenly transforms into something much more refined and beautiful. This is a most enchanting post which we have thoroughly enjoyed reading. Your post is like a wonderful lecture and has transported me to Istanbul. The murri sauce sounds delicious. I will make note of the recipe. Thank you for an enlightening post. I'd love to try making my own sausage one day - sauce must be amazing. I've been intrigued by Garum for quite some time now but Murri is new to me...would love to try my hand at making it! What a unique blend of flavors, I bet it tastes unlike anything else. Love that beautiful old Roman bottle! 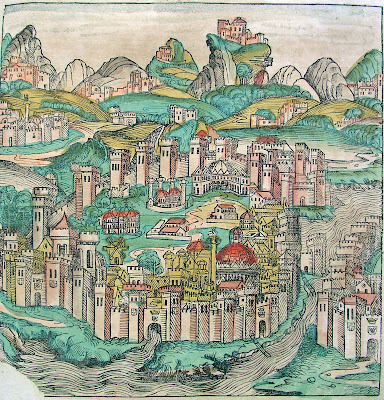 Is that drawing of Constantinople from the book Byzantium? What amazing colors. If that's an example of the other pictures, I'd LOVE to see that book. Murri is new to me and what interesting ingredients: nuts, seeds and a bit of fruit. I've never heard of nigela; looked it up and it was spelled nigella in Wikipedia...and tastes like fennel. Is that right? Why does murri end up salty? Brilliant post. I'd probably poison myself if I made this. 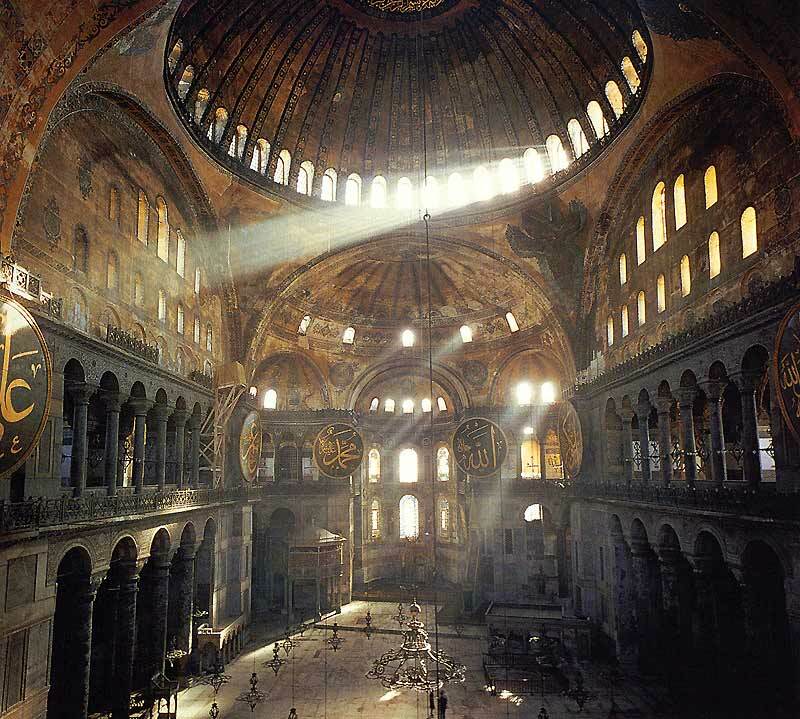 Been dying to go the Hagia Sophia since I was a boy. I'm convince that if I make your murri and merguez, I can go there via plate. Love merguez but have not tries murri 9or even heard of it before your post). Sounds divine. But where Mam, Do you source your nosebag of hair? And should it have been previously used, for extra flavor? In many ways these are so much like soy. It's strange that one should disappear while the other is now ubiquitous. You're not a nerd- you're a genius. Who else would find the fabulous history behind murri?? Great post! Very interesting post. I am amazed at how sophisticated and highly evolved the Abbasid empire was and would love -need to- order the book translated by Mr, Perry. Murri sounds a bit too complex for me, but i would order a bottle if you decided to commercialized it! Love merguez! My little guy recently studied the Hagia Sophia in art history, and of course we covered the Byzantine empire in world history about a month back. Your pictures and stories are always a wonder! It is amazing how much we can keep in our refrigerators! But I have never had this! I must try it. Also, I have never considered making my own sausages. I cannot get merguez in my little city and what a great idea to make it. 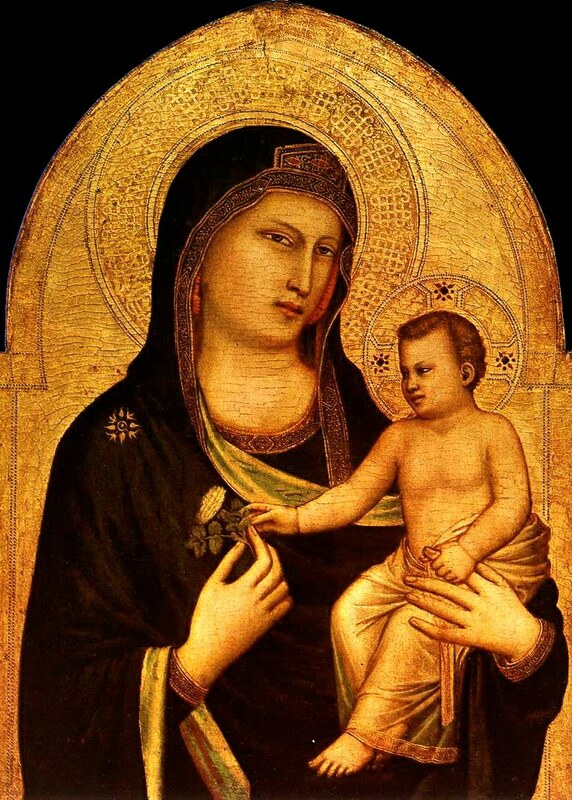 I collect religious icons and other religious art pieces. Love the Byzantine stuff and have visited the Blue Mosque in Istanbul. Great post. Byzantine murri sounds fascinating, with all the ingredients that go in it. And the sausages look seriously amazing! Deana, I'm taken by your curiosity and courage to give the ancient recipe of murri such an effort. I would have stopped at mold as my courage has been sanitized by the FDA and other warnings, and yet, I WANT to try murri. The sausages look amazing. Also, I agree with the quote “the lazy cook prepares everything by boiling.” I should know because this is what I do on my lazy days.